The four day event was staged in MiCo Milano Congressi conference centre in downtown Milan, currently the largest purpose built congress centre in Europe. 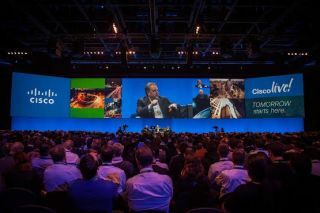 Cisco Live is the industry's education and training event for IT, networking and communications professionals. XL’s team was Project Managed by Nick Askew and Steve Greetham, who collaborated closely with Ben Hawkins, Dave Johnstone and John Carss from George P. Johnson. The team worked together to design the projection system for the 3,100 capacity plenary sessions and co-ordinate the logistics needed to make it happen. XL also supplied AV to 37 breakout areas. The left and right ends of the projection screen were angled out gently towards the audience, with three presentation podiums built in front for speakers and presenters. Ten Barco HDF-W26 projectors were used to create the image, run in five pairs (active and hot backup), rigged on a truss in the auditorium. This was edge blended together in an Encore screen management system operated by Jonathan Bond and Jason Forsythe to create a single image across the whole surface. PowerPoint, Keynote, PlaybackPro media together with live camera relays were all fed into the Encore and output to screen in a variety for formats and PiPs. One of XL’s Catalyst media servers, operated by Ben Miles, provided background media playback for the screen. This was operated via a grandMA2 light console so video elements could be flexibly timed via the desk whist still receiving timecode to sync them to the audio playback track. The Catalyst feeds were also sent to screen via the Encore system. XL supplied five Sony HXC-100 HD cameras for the plenary sessions, two positioned at the back of the auditorium and fitted with x70 lenses and the other two on dollies in front of the stage. They were augmented with a Bradley Cam-Ball 2 remote camera. These were all fed into a Panasonic HS450 PPU where Jerry Rosenfield cut the mix while Jonathan Chard, on behalf of Cisco TV, provided a separate sub-mix for the webcast via a Panasonic HS400 PPU. TX feeds from the HS450 PPU were fed into the Encore and output to the main screen. Four AJA Ki Pros were supplied to record all the sessions, and eight comfort monitors were also part of the system, all switched from a Lightware MX-FR33R modular matrix with SDI and DVI I/O and Lightware fibre systems. To integrate a 'second screen' into the plenary sessions, XL brought in Matt Mapleston to work some IT magic of his own, creating a system that communicated with devices logged on to Cisco’s on-site WiFi network, enabling messages, images, web pages, animations, videos etc. to be sent to thousands of connected devices. Delegates in the plenary room connected to the Cisco WiFi and were directed to a specific IP address via their web browser. This bought up a Cisco holding page which sprang into life with the images from the widescreen when the opening sequence began. In time with the music and the main screen the images on the hand-held devices changed, appeared and disappeared and their layouts automatically adapted to the resolution and orientation of the connected device, whatever it was - tablet or smart phone, etc. Outside of the opening VT sequence, this system was also used to display slides from the presentations on the same personal devices. For the 37 breakout rooms, XL supplied a wide selection of equipment including 36 Panasonic projectors ranging between 6 and 20K in output and each using new Lightware HDBaseT DVI-over-CAT systems. A further 37 x DVI-over-CAT systems fed Cisco web encoders, allowing sessions to be accessed after the presentation by delegates both on and off site. Twenty monitors were supplied for the breakout rooms ranging from 47 – 90 inches in size, plus 80 comfort monitors, together with over 50 Barco Image PRO II and 10 x Barco PDS-902 switcher scalers, all from XL Group stock. Video supplied by XL for other areas of the event included an 11.5 x 3 metre ‘Welcome Wall’ made up of Absen 6mm LED which was managed by XL’s Paul Wood and overseen by Graham Vinal and Steve Grinceri. “It was great fun working with Dave, John, Ben and the GPJ team on the right solutions for Cisco Live. Although I’ve worked on a number of similar scale shows before, they are all different; requiring varying systems and processes to ensure everything is in the right place at the right time.